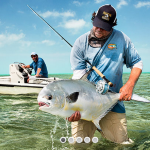 Being adjacent to the Florida Reef, the keys offer some of the best flats fishing in the world. 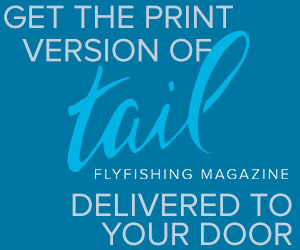 Target Bonefish, Permit, and Tarpon almost all year round but from April through October, you are always in the game for a Grand Slam. The Florida reef is the third largest reef in the world second to Australia’s Great Barrier Reef and the Belezian Barrier Reef. 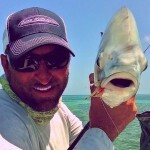 Bonefish in the upper keys and in the lesser fished areas like the Marquesas and the Dry Tortugas can run rather large. It is not uncommon to get several shots a day a double digit Bonefish. These are not the dumb hungry fish of the Bahamas, they are savvy, somewhat spooky and demand a good cast & presentation. Larger flies can be used 2-1/0 depending on the pattern. There are also Snook, Redfish, Barracuda, several different species of shark if you’re planning to stay inshore. Some of the guides actually target nurse and lemon shark which offer and exciting strip set and they put up a great fight. If your interested in Big Game, within about 15 miles of land, you can try your luck at Atlantic Sailfish, Blue & White Marlin, Mahi-Mahi False Albacore and Tuna. Blackfin Tuna are almost always in season in the Florida Keys. One of the ways they are fishes for here is following the shrimp boats and casting into the furious surface activity behind the boats that create huge chum slicks that the fish follow. There are also bonito here which resemble blackfins but are not as valued. The Sailfish come through in the winter and early spring, Marlin is best in the Summertime which is also economical if you are traveling because it’s the “off season” for Florida but the fishing is quite great from late June through September. The best time to target Sailfish is in the fall and winter which also is a good time for false albacore, blackfin tuna & resident tarpon on the beaches. There are several shrimp runs and a very predictable one in January in the upper keys which usually produces some great tarpon fishing. Geography The Florida Keys are a coral island chain in the southeast United States off the coast of Southeast Florida. The Keys were originally inhabited by Native Americans of the Calusa and Tequesta tribes. They were later found and charted by Ponce De Leon in 1513. De León named the islands Los Martires (The Martyrs) as they looked like suffering men from a distance. Clearly, people wern’t suffering in the Florida Keys. “Key” is from the Spanish Cayo, meaning small island. They begin at the southeastern tip of the Florida about 15 miles (24 km) south of Miami & extend south-southwest to Key West, the last inhabited Key. They extend further west to the inhabited islands of the Marquesas, and the Key West National Wildlife Refuge including and the Dry Tortugas National Park. The islands lie along the Florida straights which divide the Atlantic Ocean to the east from the Gulf of Mexico to the west, and defining one edge of Florida Bay. The Florida straights are also considered the origin of the gulf stream. The closest point, the southern tip of Key West is just 90 miles (140 km) from Cuba. The Florida Keys are between about 23.5 and 25.5 degrees North latitude, in the subtropics. The climate of the Keys, however, is defined as a tropical zone. More than 95 percent of the land area lies in Monroe County but a small portion extends northeast into Miami-Dade County, such as Totten and the northern keys of Biscayne Bay. The total land area is 137.3 square miles (356 km2). 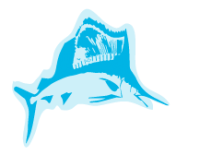 Monroe County consists of a section on the mainland which is almost entirely in Everglades National Park, (see Flamingo) and the islands of the Flordia Keys from Key Largo to the Dry Tortugas. Geology The Florida Keys are the exposed portions of an ancient coral reef. The northernmost island arising from the ancient reef formation is Elliott Key, in Biscayne National Park. All of southern Florida was covered by a shallow sea. Several parallel lines of reef formed along the edge of the submerged Florida plateau, stretching south and then west from the present Miami area to what is now the Dry Tortugas. Just offshore of the Florida Keys along the edge of the Florida Straits is the Florida Reef. The Florida Reef extends 270 km from Fowey Rock just east of Soldier Key to just south of the Marquesas Keys. It is the third largest barrier system in the world, second to Australia’s great barrier reef and the Belize Barrier Reef in Central America.